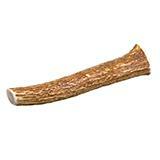 Red Barn's Natural Solid Antler dog chews are made from the shed antlers of wild, free roaming deer. Antlers are ideal for vigorous chewers and also help clean teeth and gums. Great for pups too! As with any dog chew, supervise your pets while antlers are being chewed.